Choosing to be a farmer was simple for Bob Brackmann. “I’ve always enjoyed working outdoors and the challenge of being able to prevent and solve day to day problems. It brings a real sense of accomplishment” he says. Bob also appreciates the satisfaction that comes with the beginning and ending of each planting and harvest season and working with other farmers. 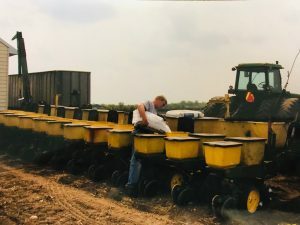 In previous years, Bob has held several jobs off the farm including trucking, construction, real estate, and doing custom work for other farmers. Today, he farms with his wife, Nancy, and his friends growing corn, soybeans, and wheat.